When an aircraft starts its take-off run on the runway the tremendous thrust produced by its roaring engines is felt by the passengers who literally sink in their seats. Engines provide propulsion to aircraft so that it can be in air as long as there is enough fuel. Over the years, aircraft engines have evolved into a highly efficient and trustworthy machine, which works on simple principle but extremely, complicated designs. In the early days, and in some cases even now, aircraft run on a typical four-stroke internal combustion engine, in other words, a piston engine. Like any other car engine, piston compresses the air-fuel mixture in a cylinder, which gets ignited resulting in burning of gases producing power. The burnt gases are emitted from the exhaust. Because all these actions take place in a sequence, it is known as four-stroke engine. These strokes being: intake, compression, power and exhaust. 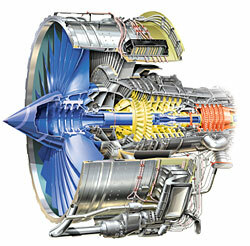 But the modern aircraft derives its power from fascinating pieces of engineering known as the jet engine. The fact that the era in which all of us live is described as jet age is a testimony of its significance. The jet engine has evolved a great deal since Greek mathematician Hero’s aeolipile, a nozzled steel ball that spun with the escape of steam, was first tested. Jet engine works on Newtonian principle of every action has an equal and opposite reaction. The engine has three sections: compressor, combustor and the turbine. To push the aircraft forward, front intake of the engine draws air, which after compression, is ignited. The expanded gases go into the turbine, which drives the compressor that takes more air. The hot gases exit from the exhaust pushing forward the aircraft, which takes off with the help of the wings. The basic jet engine is known as turbojet but when engine uses thrust to turn a propeller, it is known as a turboprop. And when it drives helicopter rotor blades, it is known as turbo shaft. The most commonly used form in the modern aircraft is the turbofan engine, which is essentially a turbojet with a fan. These fans can be placed both in front and back of the engines. A jet engine is not only safe but also extremely efficient. It works best at higher altitudes and can fly at supersonic speeds. Jet engines have helped billions of people over the years to fly around the globe.